A travel case and an extra brush head are what fundamentally set these two brushes apart. Both offer a great clean, feel comfortable in hand and have a decent battery life. For most the Pro 2 2000 presents the best value and is our recommendation. If you would like a broader comparison of buying options, see our reviews and buyer’s guide here. The Pro 3 3000 comes with 2 brush heads (1 x CrossAction and 1 x 3D White) compared to the 1 of the Pro 2000 (1 x CrossAction/Sensitive/3D White (subject to variant)). Pro 3 3000 comes with a travel case. Pro 2 2000 generally cheaper to purchase. 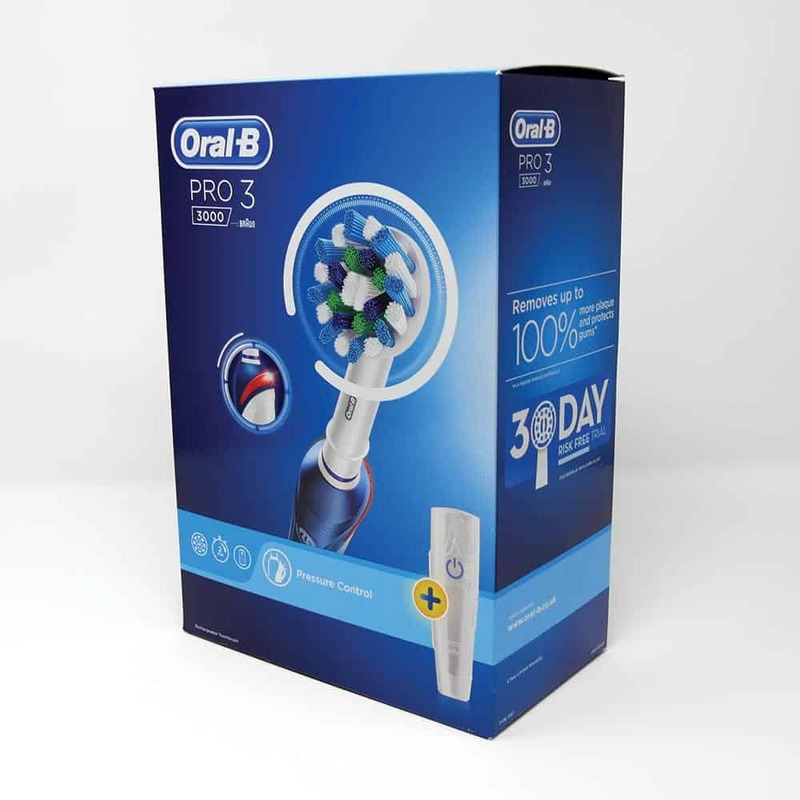 In 2017 Oral-B have launched the Pro 2 2000 and the Pro 3 3000 which we are comparing here. These are replacements to the Pro 2000 and the Pro 3000, note the extra 2 and 3 in the product names for the newer models. The primary difference between the older model and 2017’s new model is the battery. The older NiMH battery has been replaced with Li-Ion, doubling the battery life. The Pro 3 3000 has also lost a cleaning mode and has a slightly different box contents. A comparison of the older models is available here. 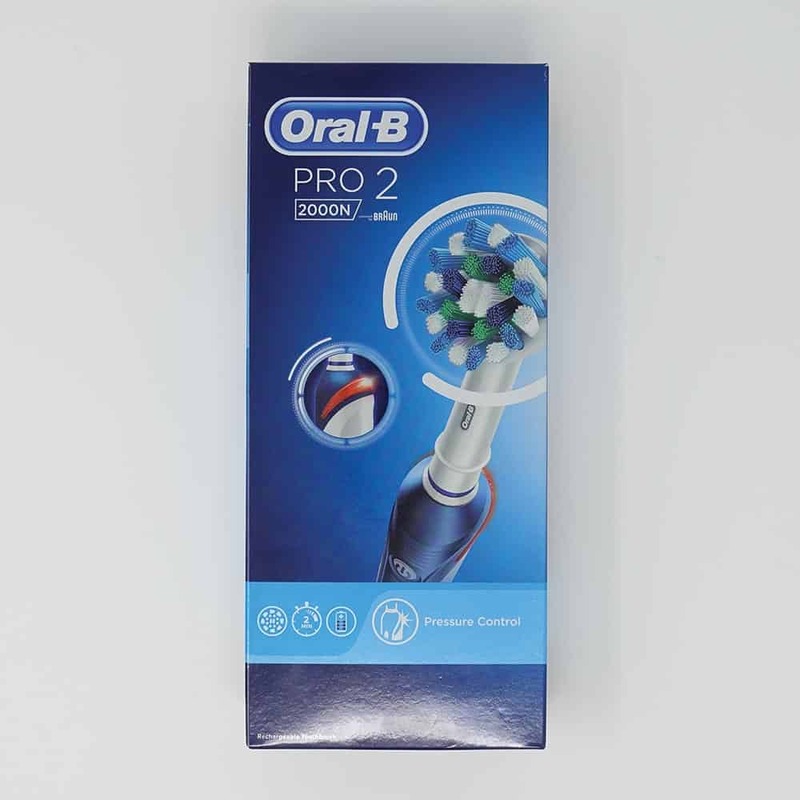 Detailed Comparison: What’s the difference between the Oral-B Pro 2 2000 and Pro 3 3000? In the summer of 2017 Oral-B refreshed their range of brushes, updating current models, replacing the Nickel Metal Hydride (NiMH) batteries with Lithium-Ion (Li-Ion). Simply swapping the batteries, doubles the battery life, to 2 weeks, which is fantastic. As they did this though they decided to make some revisions to the popular Pro 3000, now named the Pro 3 3000. Where once it had 3 cleaning modes, it now has 2, the same number as the Pro 2 2000 to which we are comparing it. What actually sets these two brushes apart is very little, so which one is the one for you? At the time of writing the Pro 2 2000 comes in 3 different variants. These are the Pro 2 2000N, 2000S and 2000W. The letters refer to the brush head that comes supplied in the box. N = CrossAction, S = Sensitive and W = 3D White. Whatever variant you opt for the brush is technically the same it is the 1 brush head that comes supplied that differs. Whilst this is subject to change, the colour of the brush handle supplied with the 2000N and 2000S is usually Blue and White. Whereas with the 2000W the handle is Pink and White. The body of the Pro 2 2000 and the 3 3000 is made from a gloss White plastic with a contrasting rubber grip that runs down the front of the handle. It is this rubber grip that is either Blue or Pink in colour. The Pro 3 3000 is at the time of writing sold in only one variant. 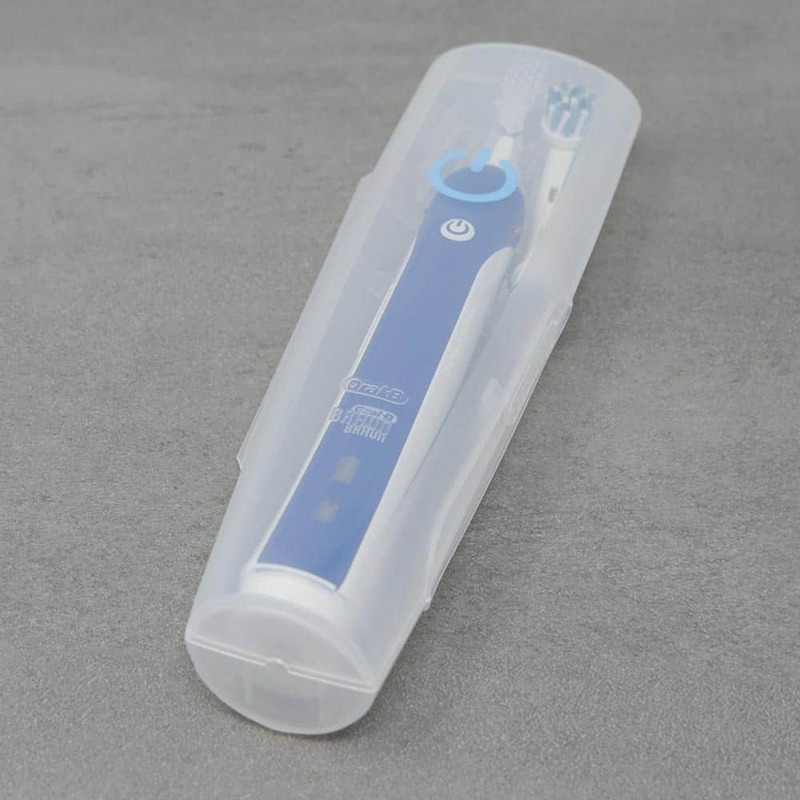 It has a Blue rubber grip and the White plastic body. Supplied with the 3000 though is 1 x CrossAction and 1 x 3D White brush head. So that means 1 extra brush head in the box with the 3000. Aside from the price, which we will cover shortly, the other key difference is that the Pro 3 3000 comes supplied with a travel case. It is a fairly basic, yet functional case that holds the brush handle and up to 2 brush heads. It is a translucent colour, that is just a little taller and thicker than the brush itself. Hinged on the left side, the case folds open and closes like a book with a clip on the right edge that holds the case closed. A relatively thin plastic case it is likely what you expect.of an item of this type, but it is not as premium as some other case options. Aside from the aforementioned differences the brushes are the same. They both offer 2 cleaning modes, Daily Clean and Gum Care mode. A built in timer and pacer are available on each as is a visible pressure sensor. The built in battery lasts 2 weeks and can be recharged via the charging stand that is included in the box. Slim handles, they are relatively lightweight and robust and water resistant, with a 2 year warranty. No, there is no difference between the way in which these two brushes clean. Both have the same motors and the same cleaning modes. Unlike some models that do have more or less powerful motors and different modes, these are identical. The slight catch to this is that the results may differ depending on the brush heads used. 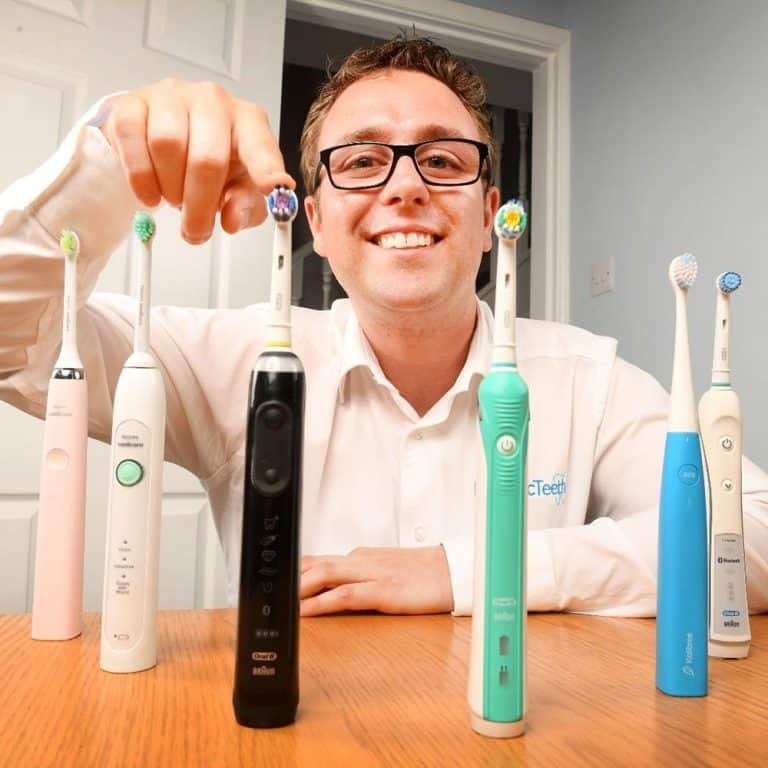 As we explained different ones come supplied, but all the Oral-B heads are interchangeable and can be used on different models. You can learn more about the different heads and how they perform by reading our ultimate guide to Oral-B brush heads. Assuming you use the same brush head on the different handles you would see no difference in the clean. Yes. In most instances, of course this can vary from one retailer to another, the Pro 2 2000 will be cheaper than the Pro 3 3000. The recommended retail price of the brushes are £69.99 and £99.99. Despite this more typical selling prices are around £30-40 for the Pro 2 2000 and £45-55 for the Pro 3 3000. Using the average selling prices we have seen the lowest price difference will be around £10 with the average difference being about £15 and at the higher end a £25 difference. The travel case and brush head that differentiate these two models can be purchased individually for around £15-20, so there is some saving and convenience to be had by buying the Pro 3 3000. A travel case is a handy addition in the box of the Pro 3 3000 and one that is often underrated. However, based on our experience our recommendation is to go for the Pro 2 2000. Many do not need or want the case. The typical selling prices of the Pro 3 3000 make the case a relatively expensive addition. If you want a brush that is good value with a travel case take a look at the Pro 2 2500. Using the information presented here, draw your own conclusions and consider the prices at the time you are looking to buy, but we believe most will be happiest in opting for the Pro 2 2000. Wat is the rotation and pulsating speeds of the new pro 2 2000 and pro 3 3000 models? The Pro 2 2000 and 3 3000 offer up to 8,800 oscillations and 40,000 pulsations.